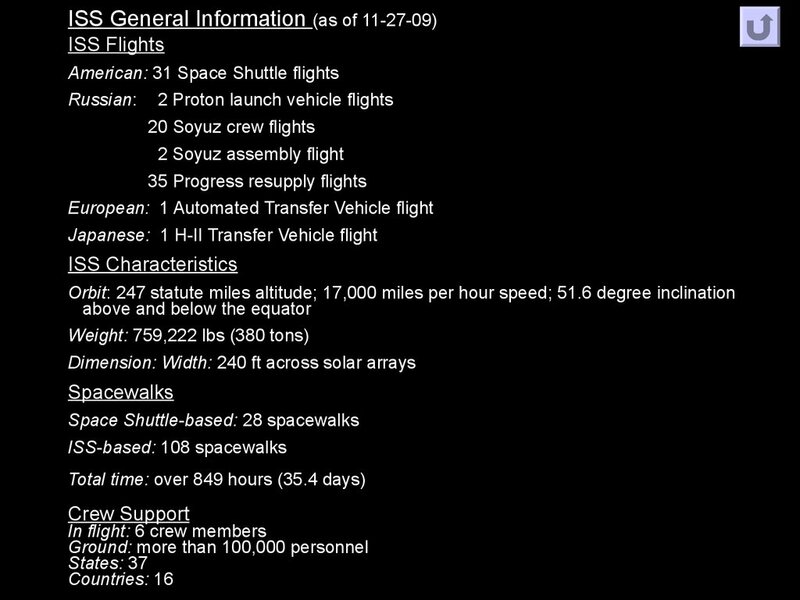 separation during the STS-130 Mission. 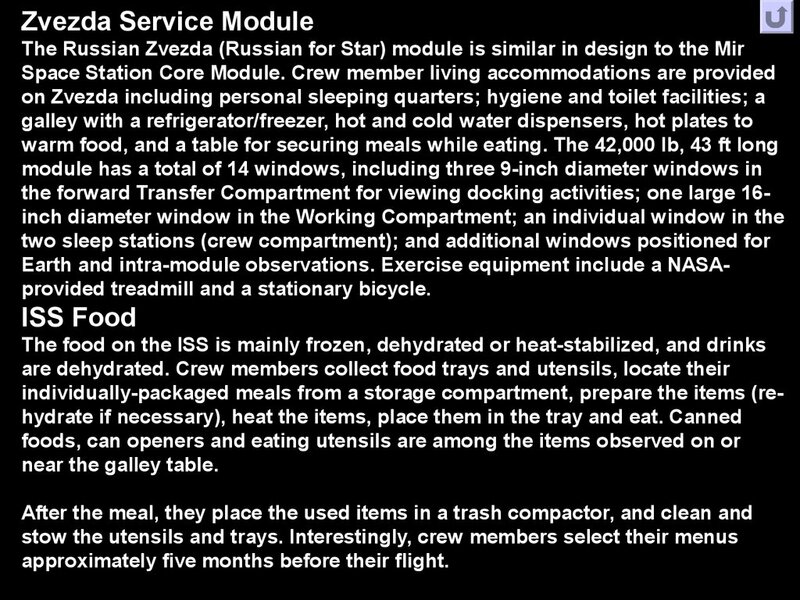 Service Module at the galley. 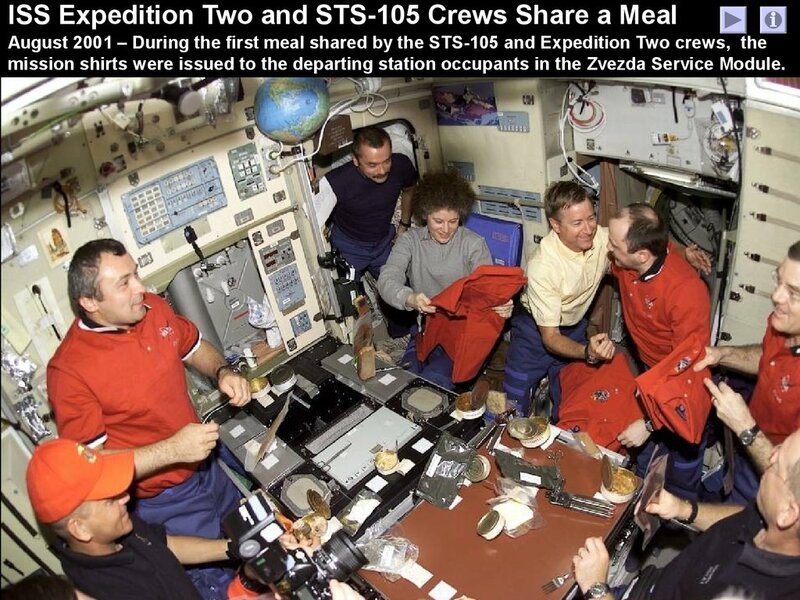 Expedition Two is hosting the STS-104 astronauts. 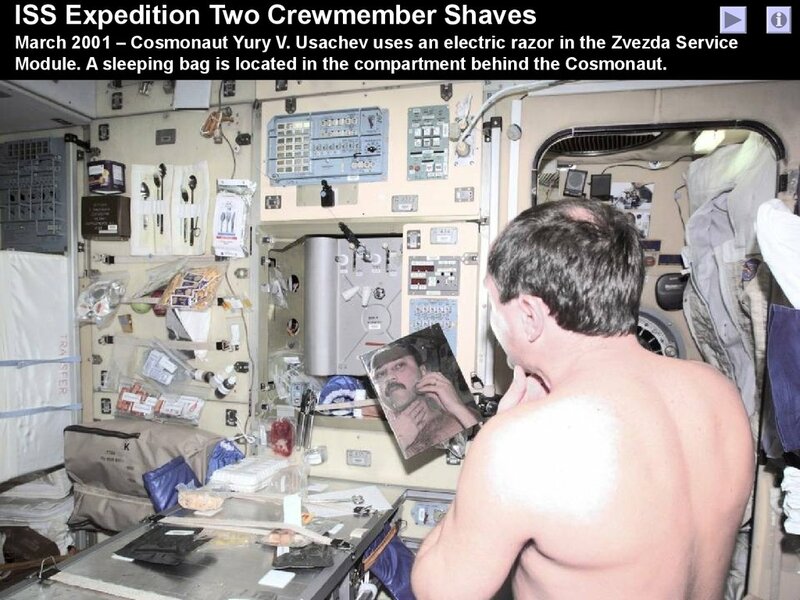 mission shirts were issued to the departing station occupants in the Zvezda Service Module. 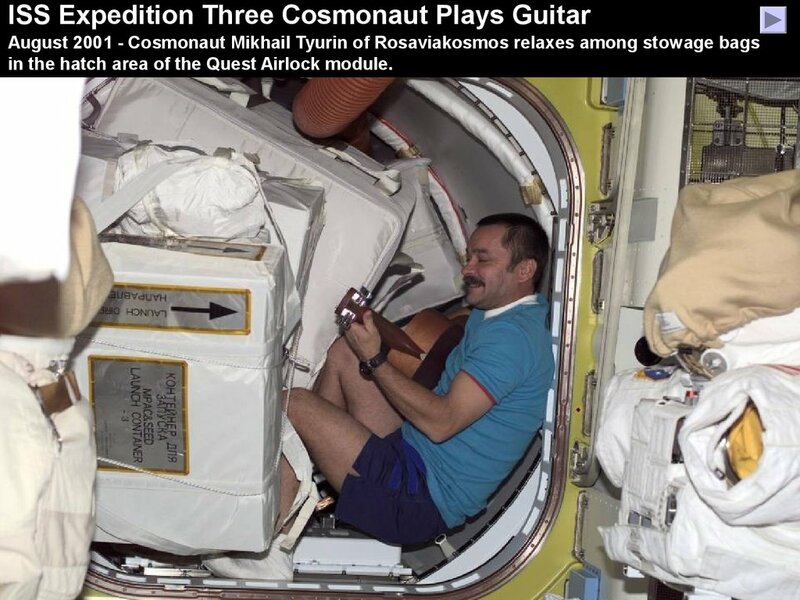 in the Zvezda Service Module. 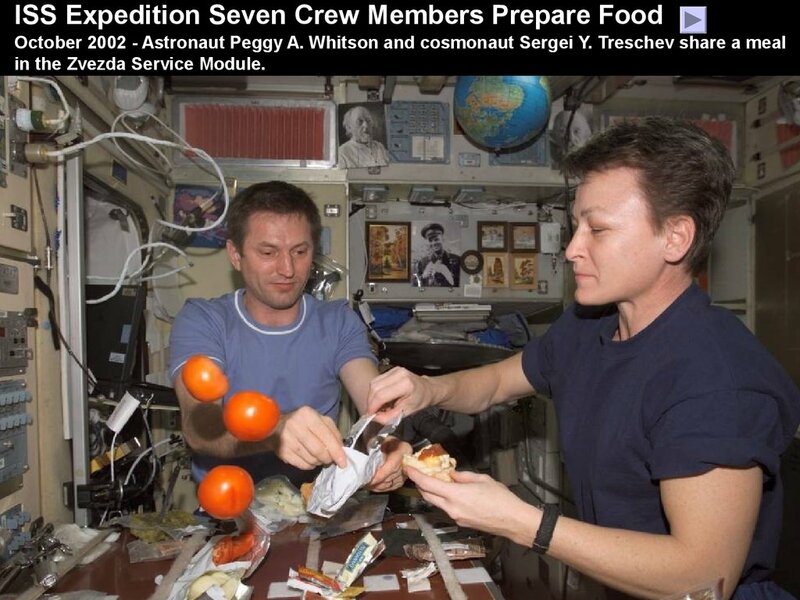 at the galley in the Zvezda Service Module. Module. 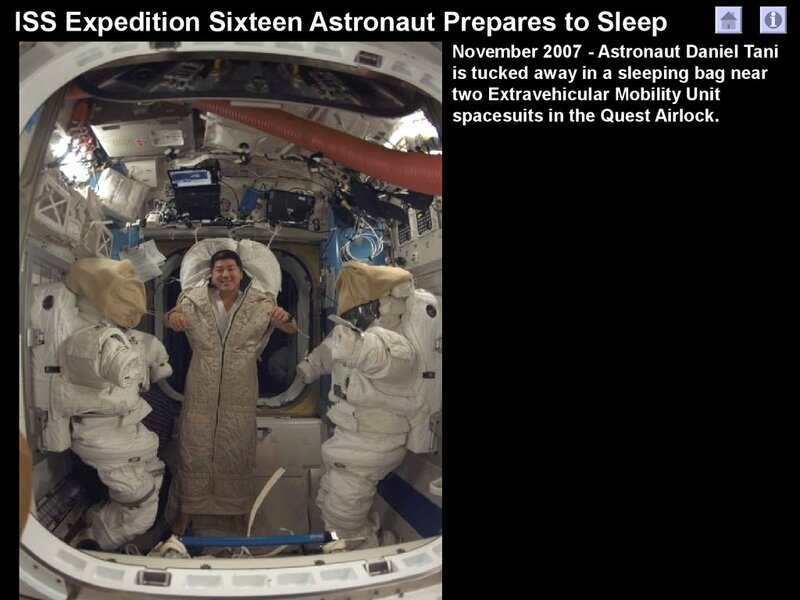 A sleeping bag is located in the compartment behind the Cosmonaut. 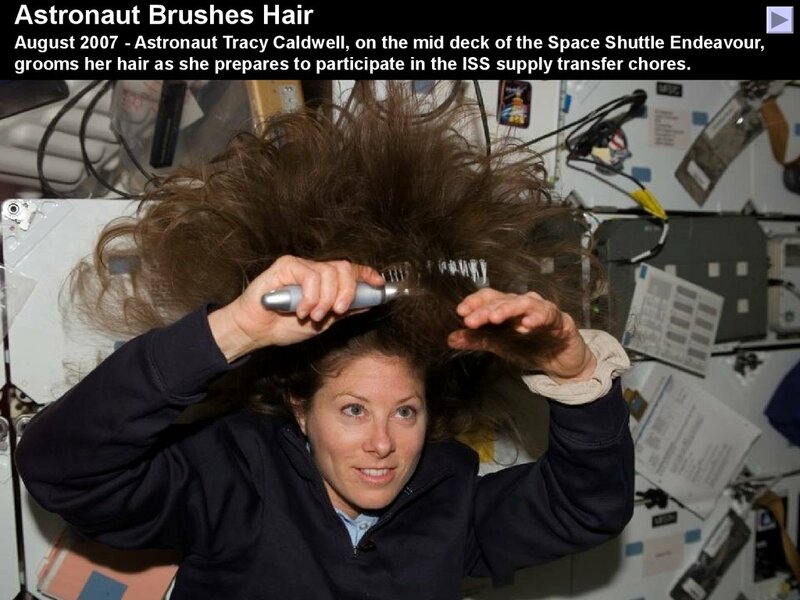 grooms her hair as she prepares to participate in the ISS supply transfer chores. 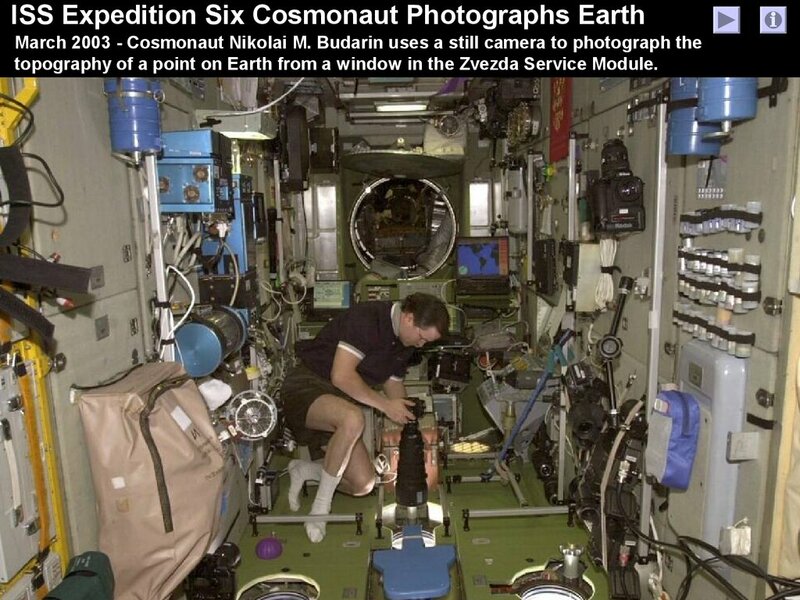 spacesuits in the Quest Airlock. 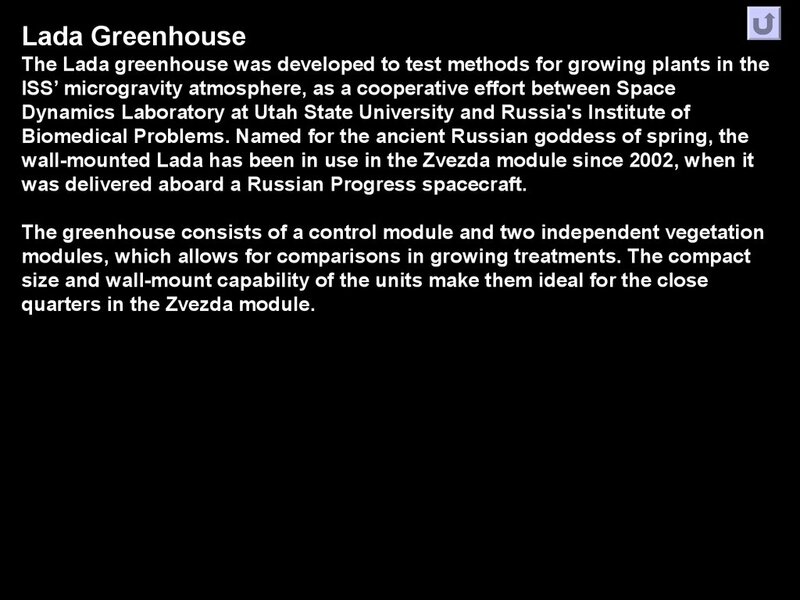 topography of a point on Earth from a window in the Zvezda Service Module. (CBOSS) in the Destiny laboratory. 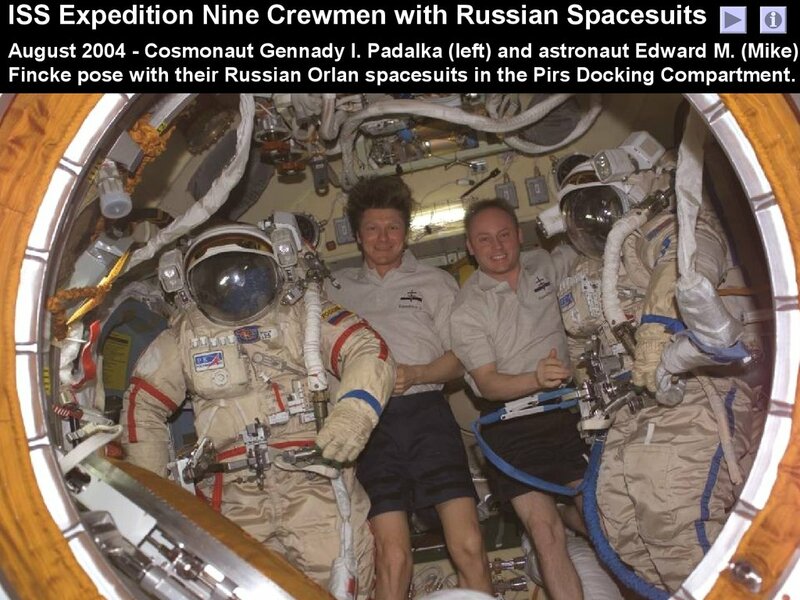 Fincke pose with their Russian Orlan spacesuits in the Pirs Docking Compartment. 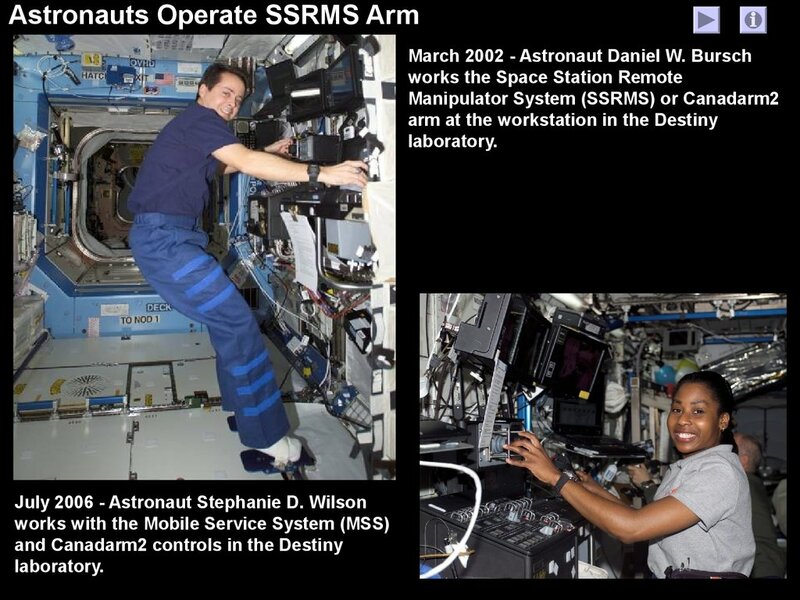 scheduled session of extravehicular activity (EVA) for the STS-112 mission astronauts. 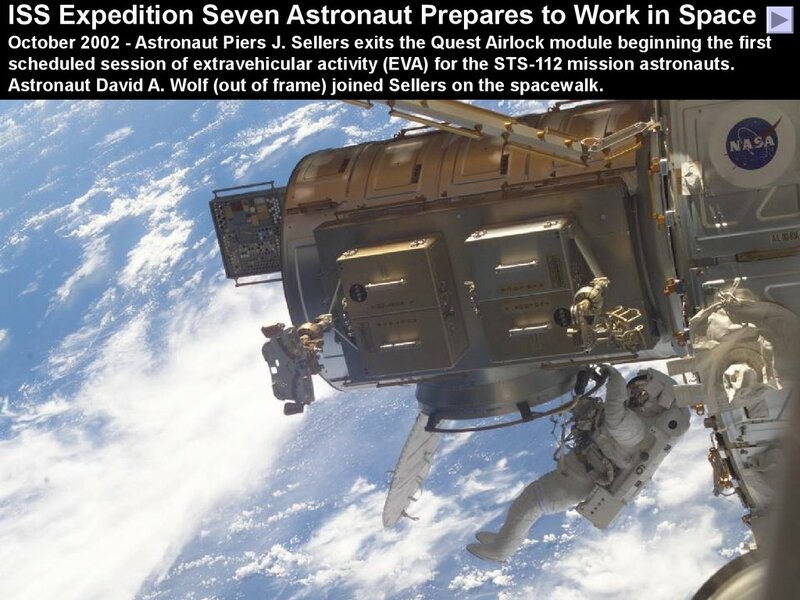 Astronaut David A. Wolf (out of frame) joined Sellers on the spacewalk. 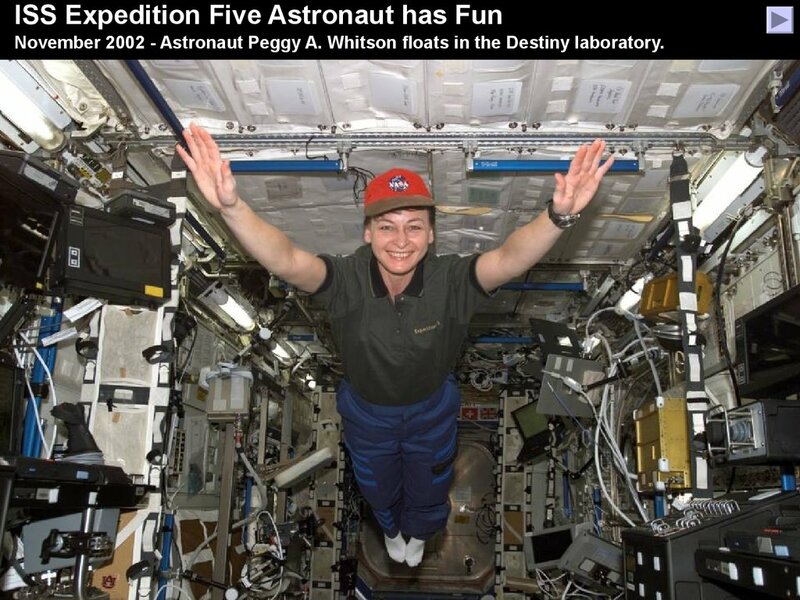 November 2002 - Astronaut Peggy A. Whitson floats in the Destiny laboratory. 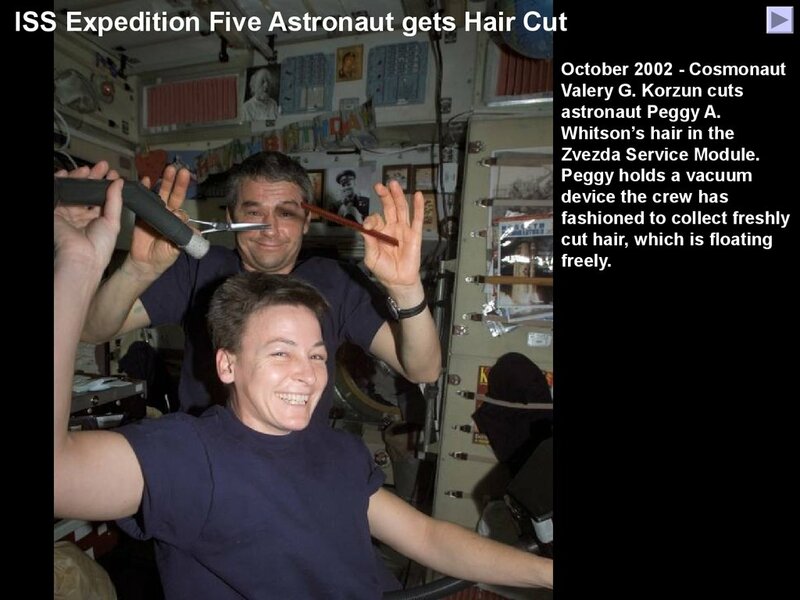 April 2001 - Astronaut Susan J. Helms pauses from her work while cosmonaut Yury V.
Usachev speaks into a microphone aboard the Destiny laboratory. 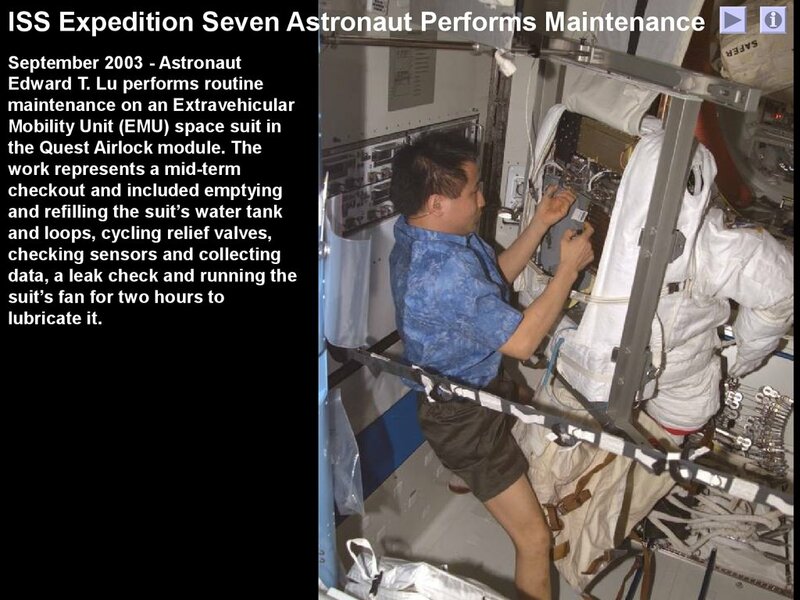 April 2001 – Astronaut James S.
treadmill and a stationary bicycle. 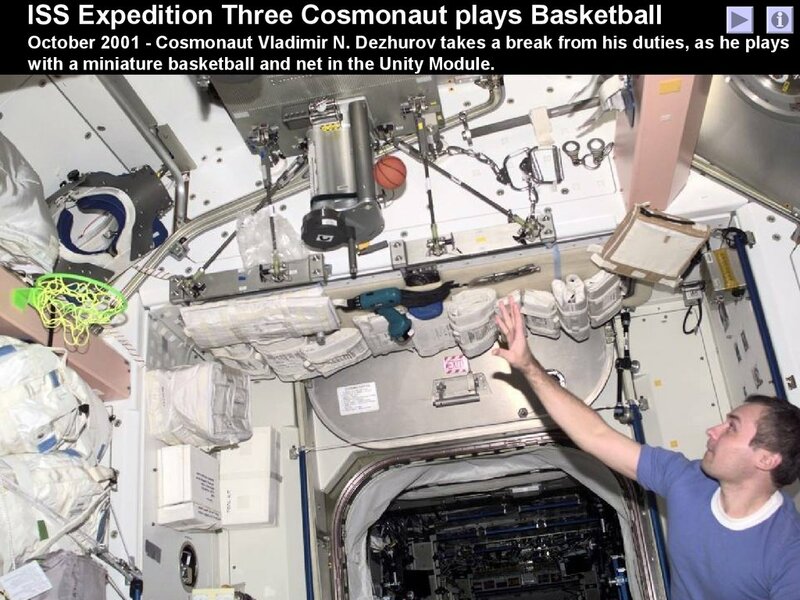 with a miniature basketball and net in the Unity Module. 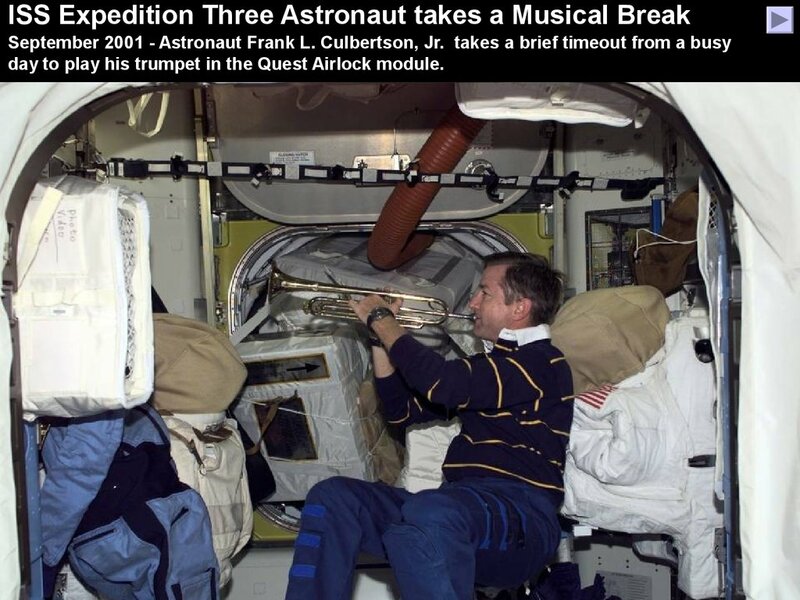 day to play his trumpet in the Quest Airlock module. 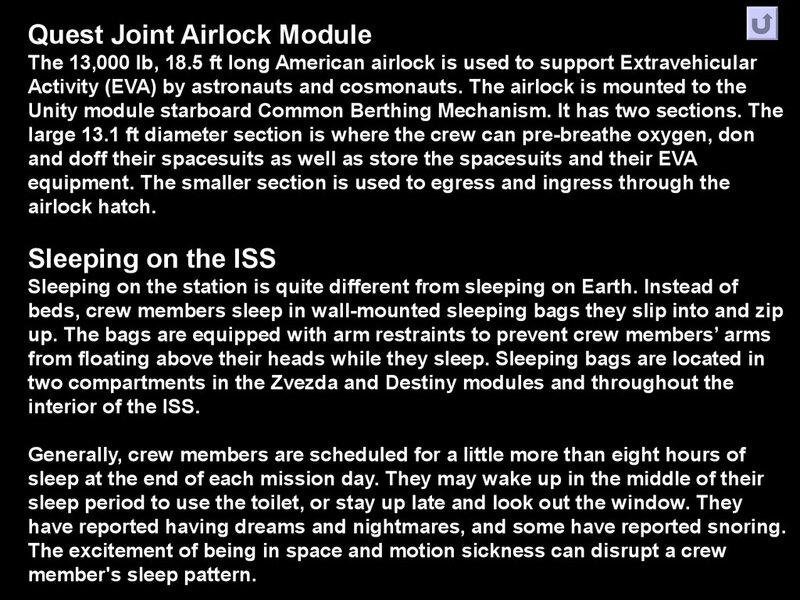 in the hatch area of the Quest Airlock module. 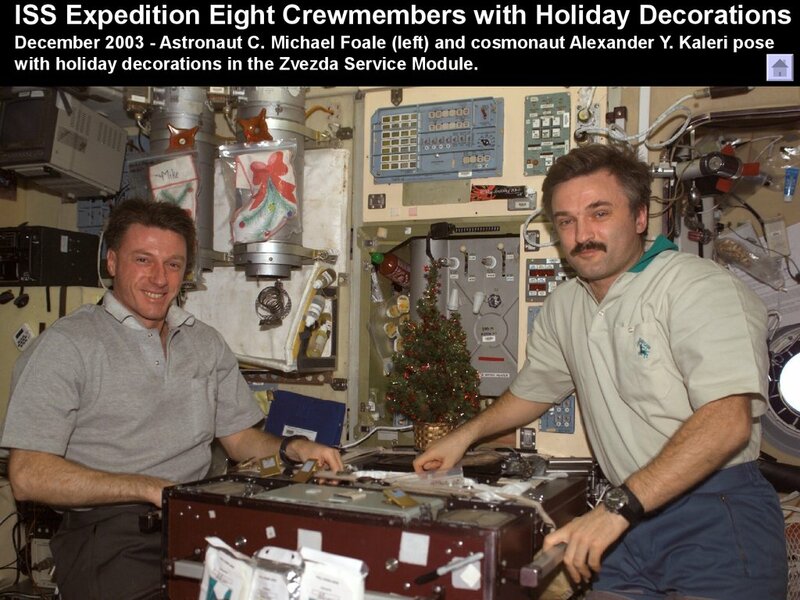 with holiday decorations in the Zvezda Service Module. 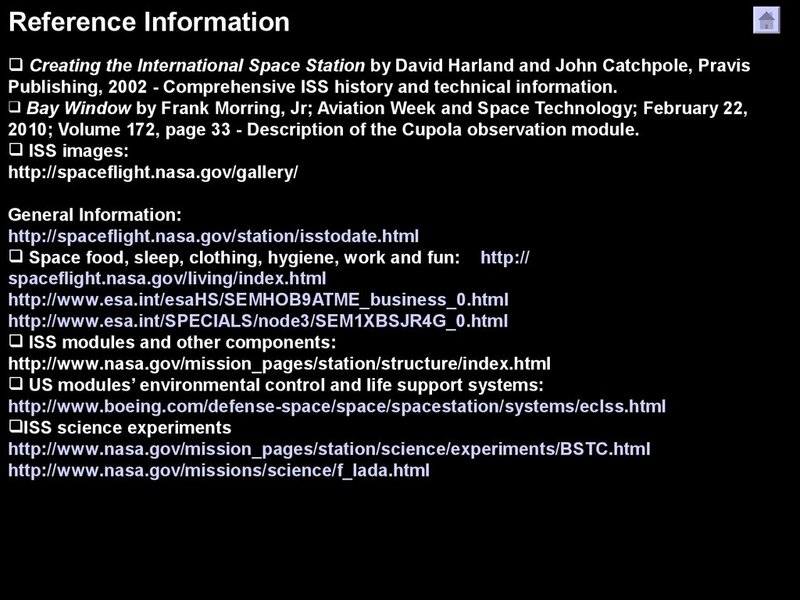 Publishing, 2002 - Comprehensive ISS history and technical information. 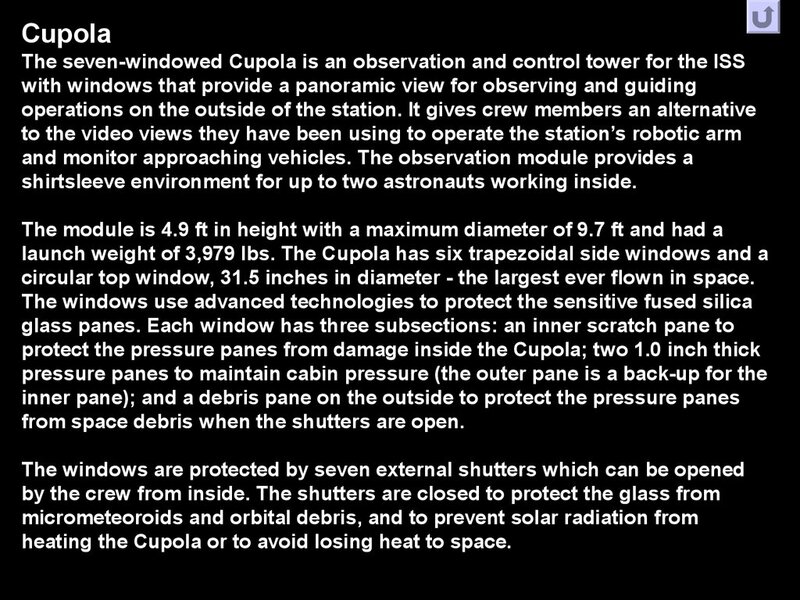 2010; Volume 172, page 33 - Description of the Cupola observation module. 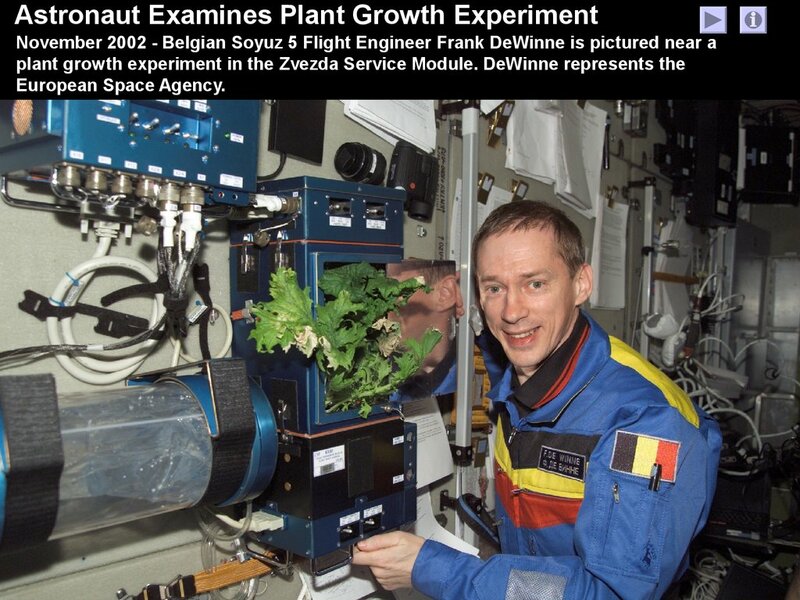 Earth and intra-module observations. 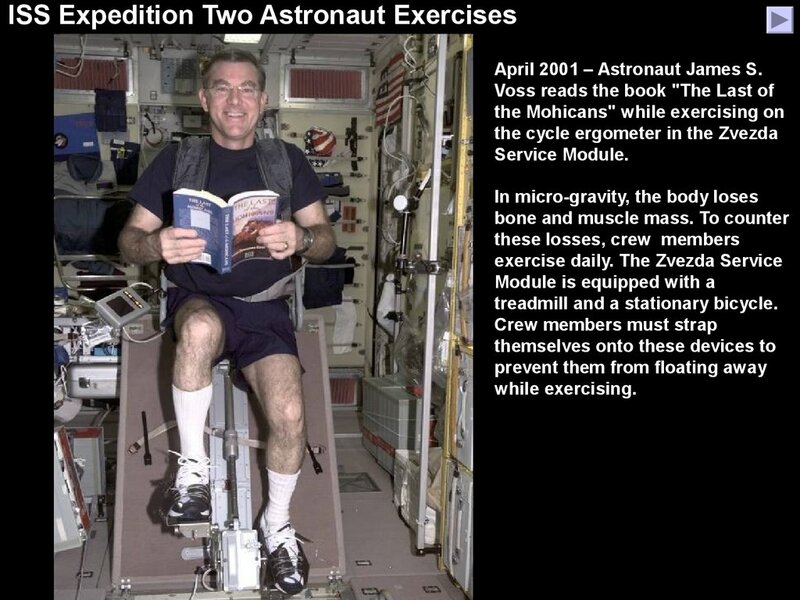 Exercise equipment include a NASAprovided treadmill and a stationary bicycle. approximately five months before their flight. resembles those used on Earth. 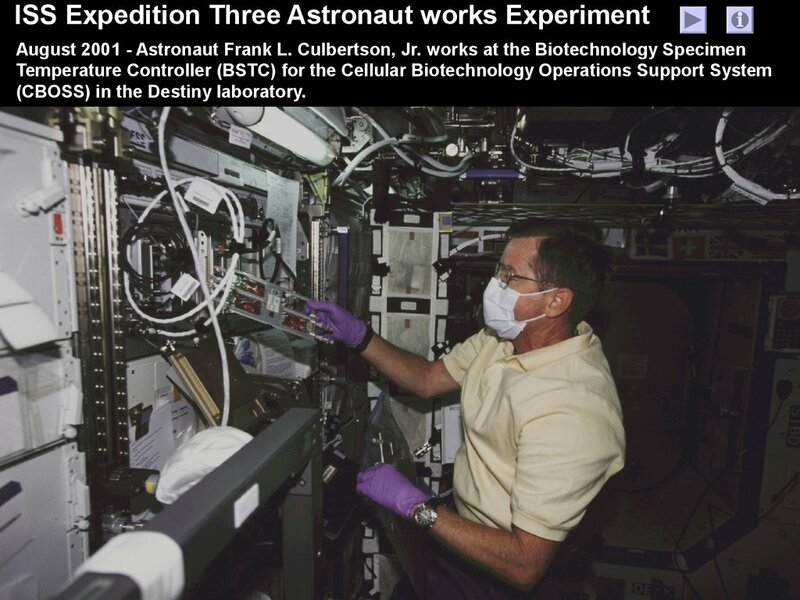 in the American Tranquility module. 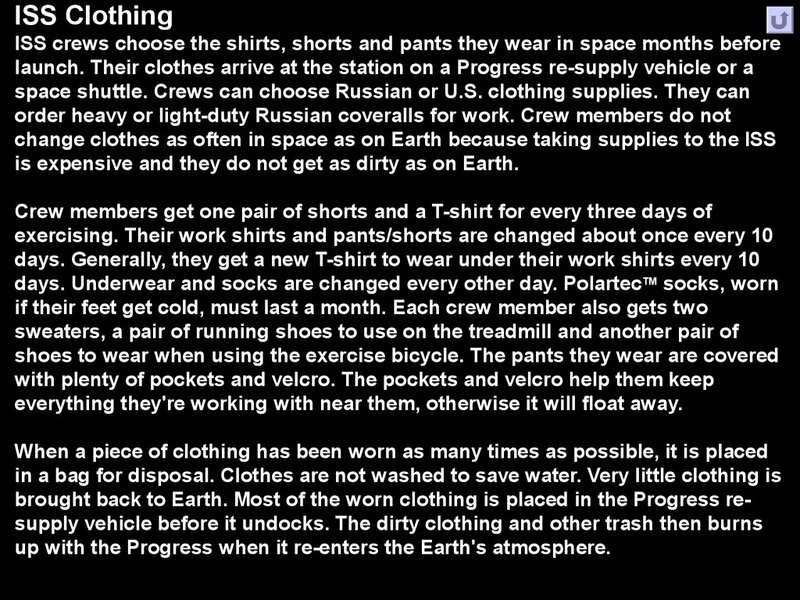 is expensive and they do not get as dirty as on Earth. 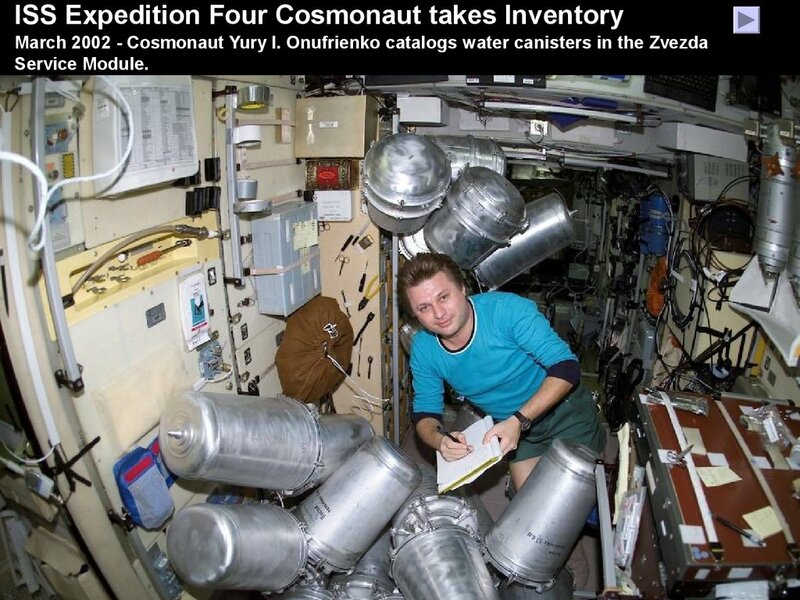 everything they're working with near them, otherwise it will float away. 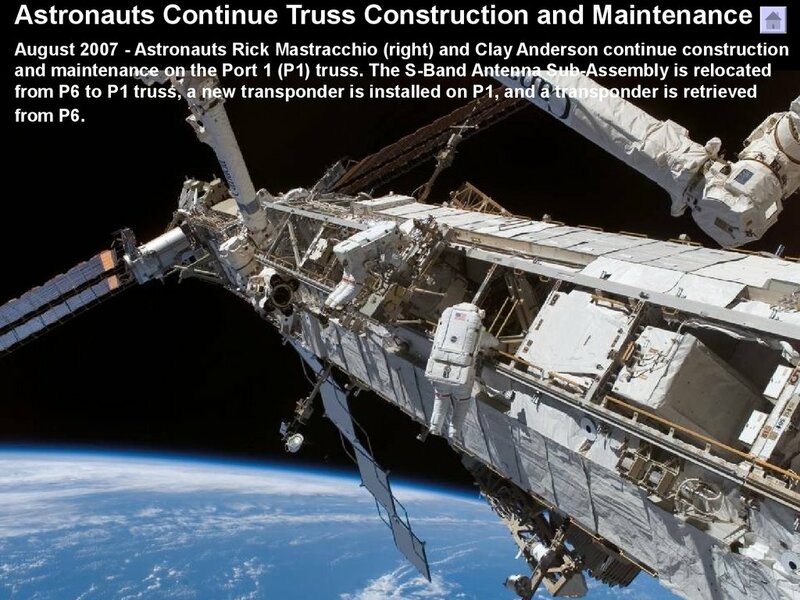 up with the Progress when it re-enters the Earth's atmosphere. have reported having dreams and nightmares, and some have reported snoring. and eating meals, 8.5 hours sleeping, and 14 hours exercising and working. them from floating away while working. 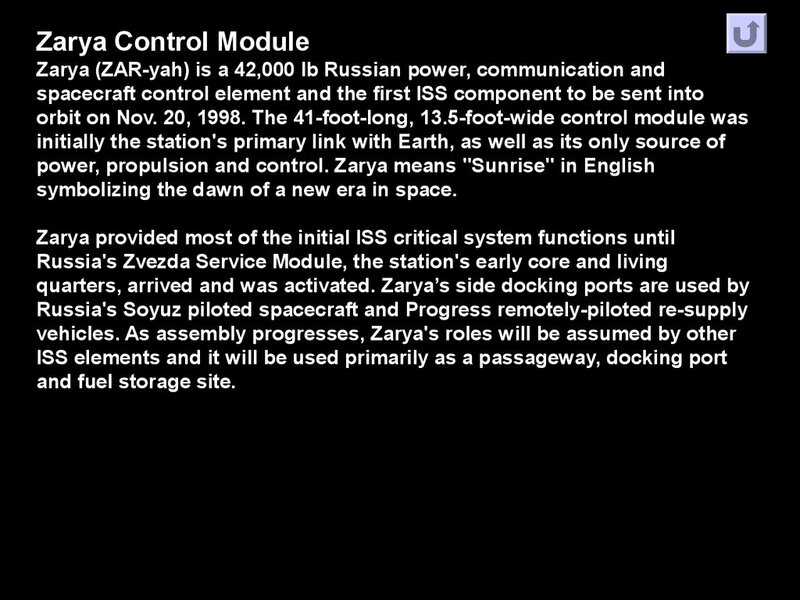 symbolizing the dawn of a new era in space. equipment racks. 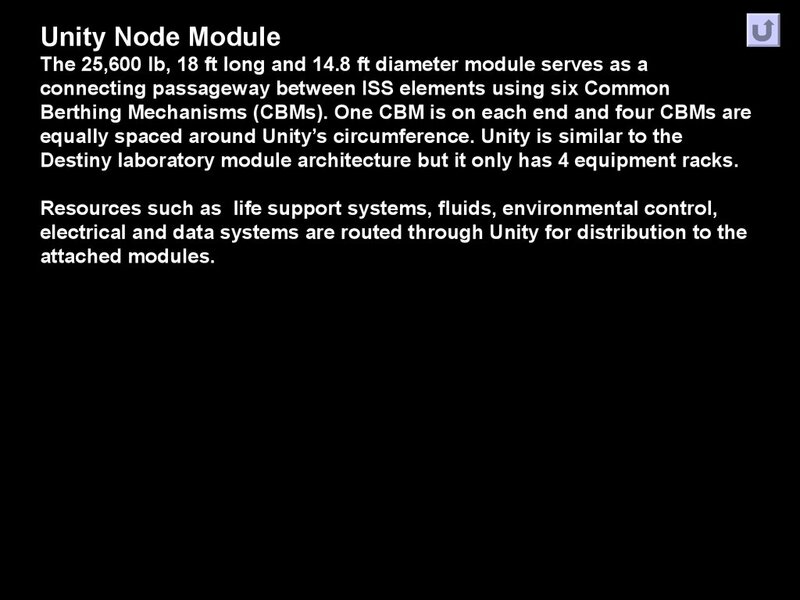 The module can hold 24 equipment racks with 6 on each side. 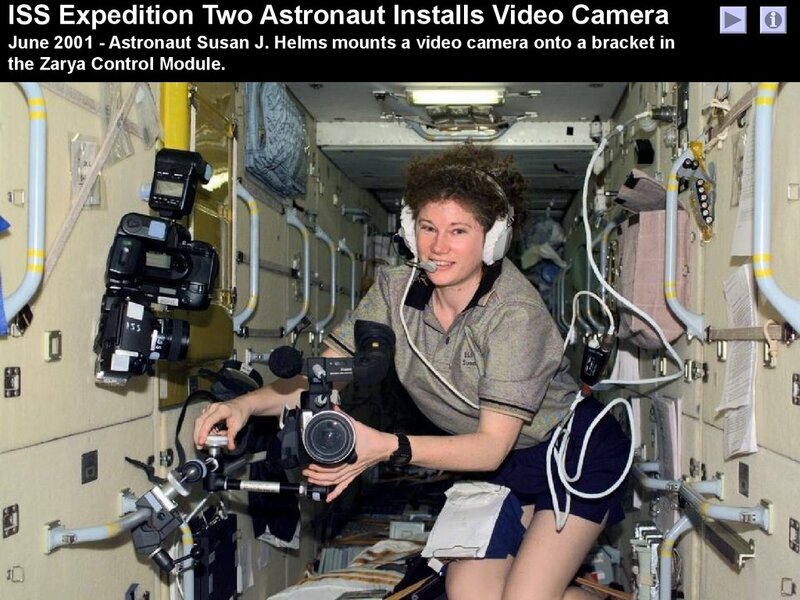 provides EVA support. 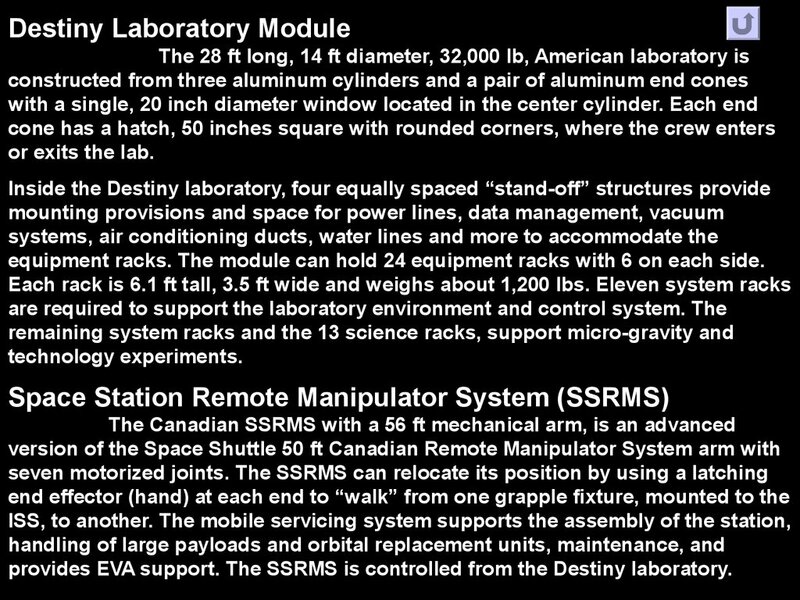 The SSRMS is controlled from the Destiny laboratory. 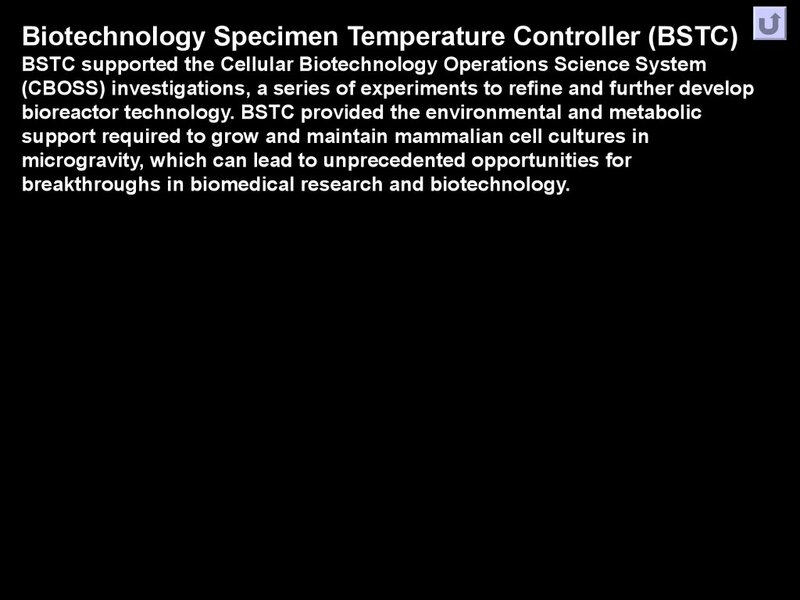 breakthroughs in biomedical research and biotechnology. 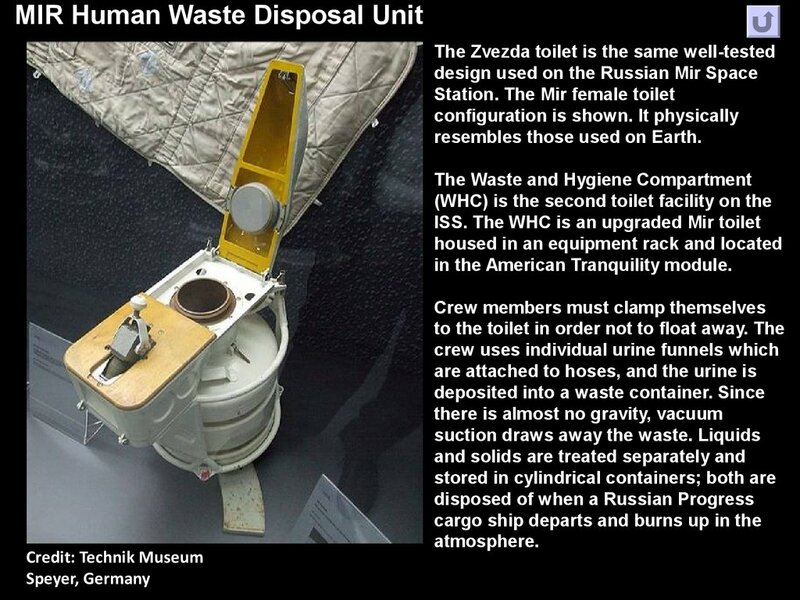 was delivered aboard a Russian Progress spacecraft. 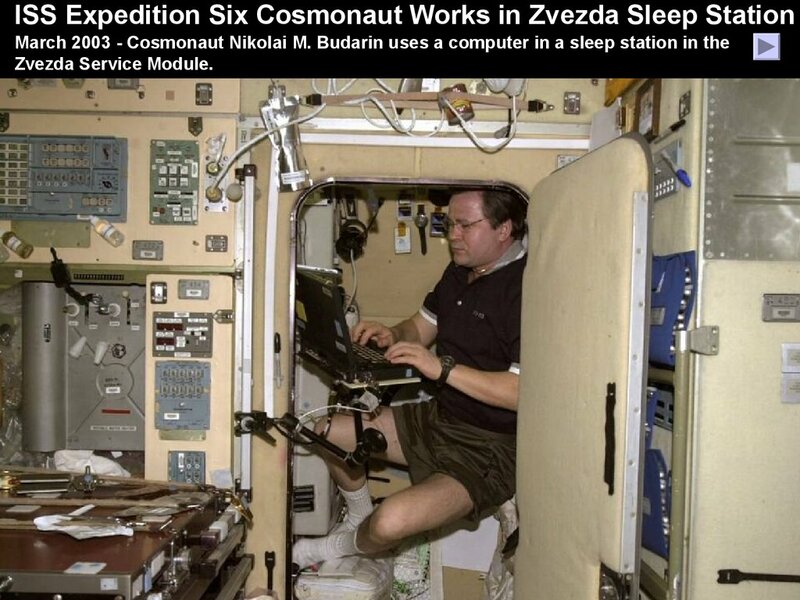 quarters in the Zvezda module. suits. 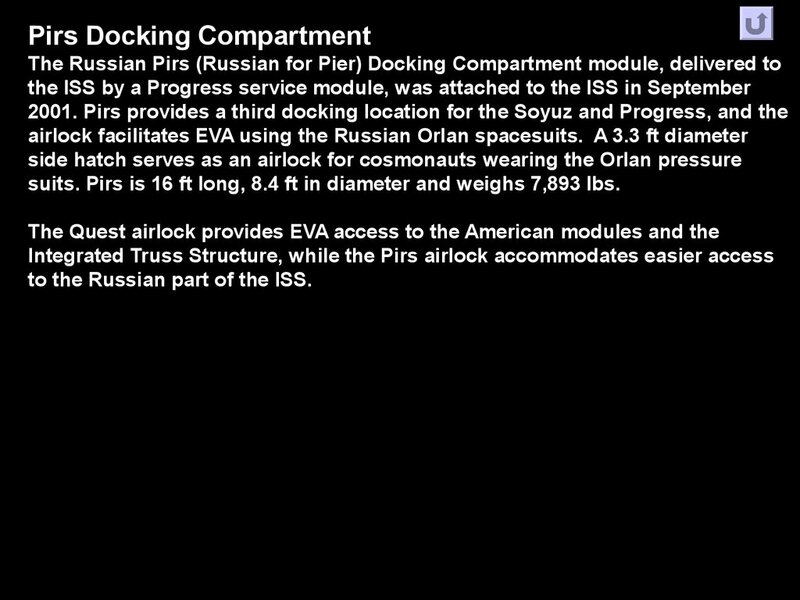 Pirs is 16 ft long, 8.4 ft in diameter and weighs 7,893 lbs. 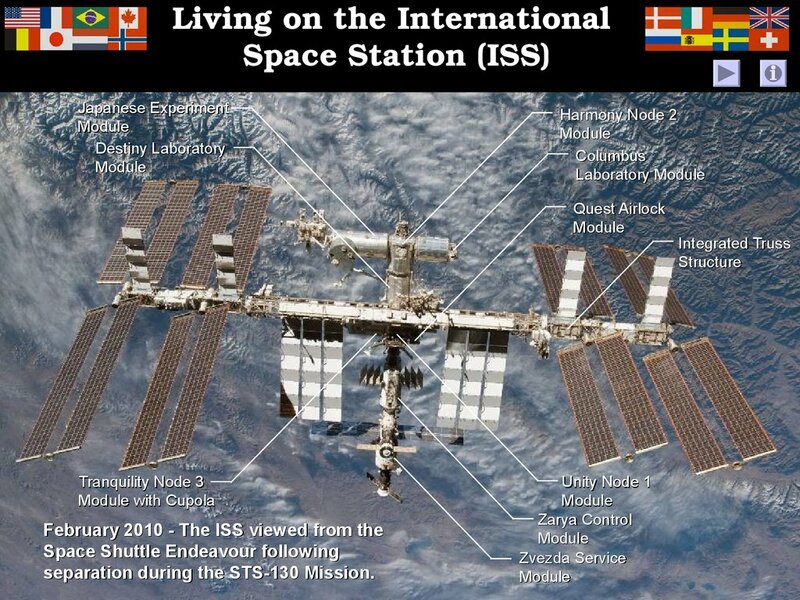 to the Russian part of the ISS. 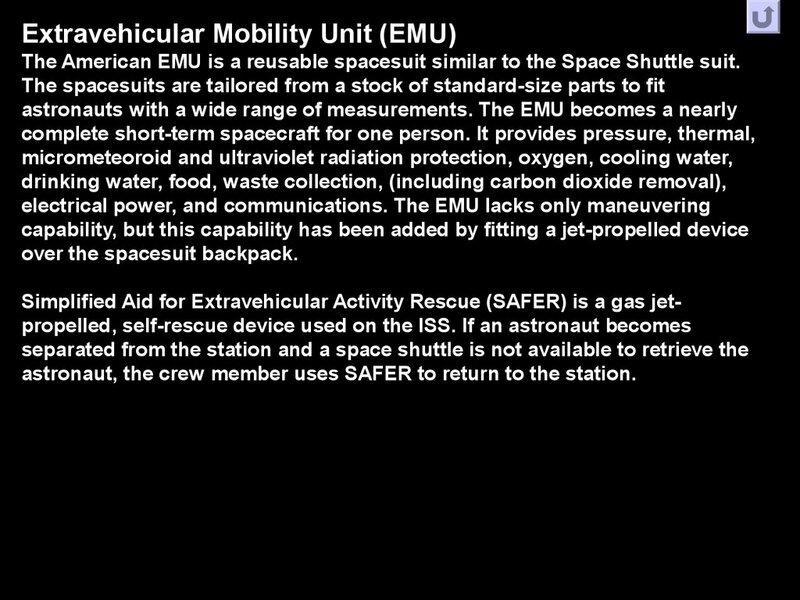 The American EMU is a reusable spacesuit similar to the Space Shuttle suit. 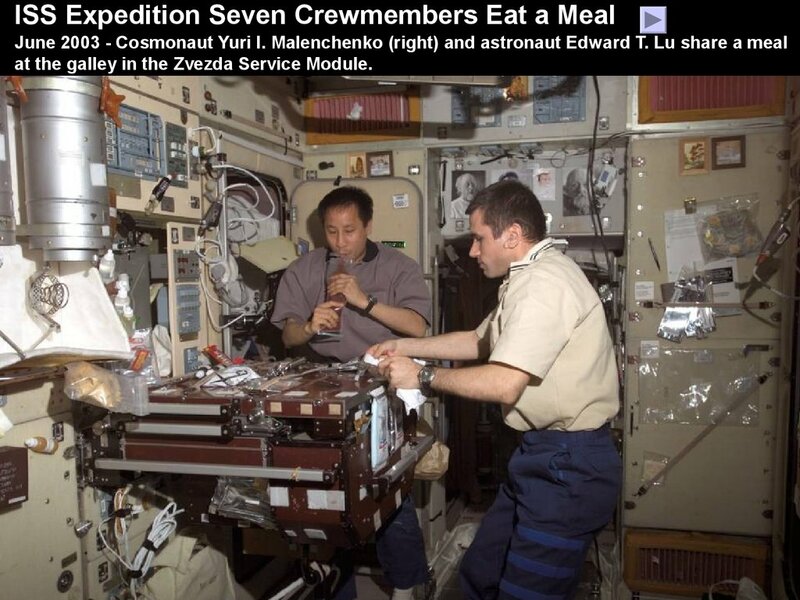 astronaut, the crew member uses SAFER to return to the station. 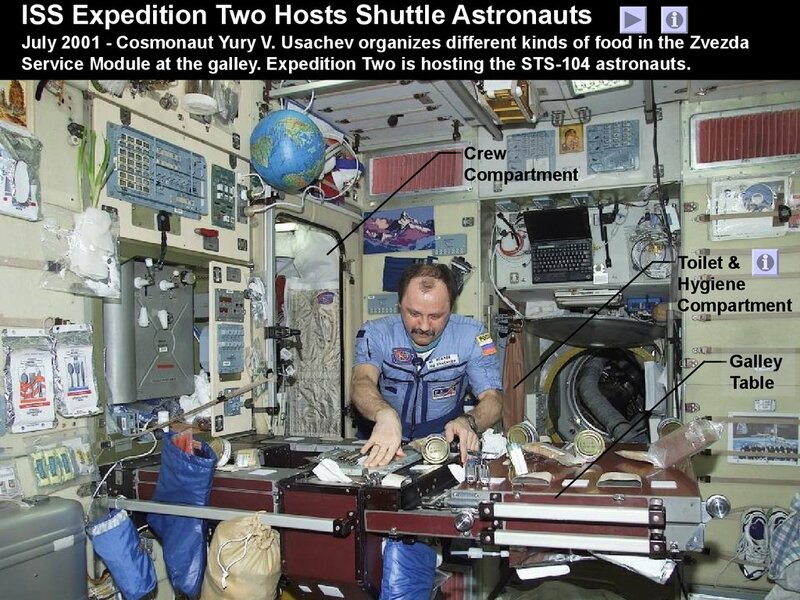 shirtsleeve environment for up to two astronauts working inside. 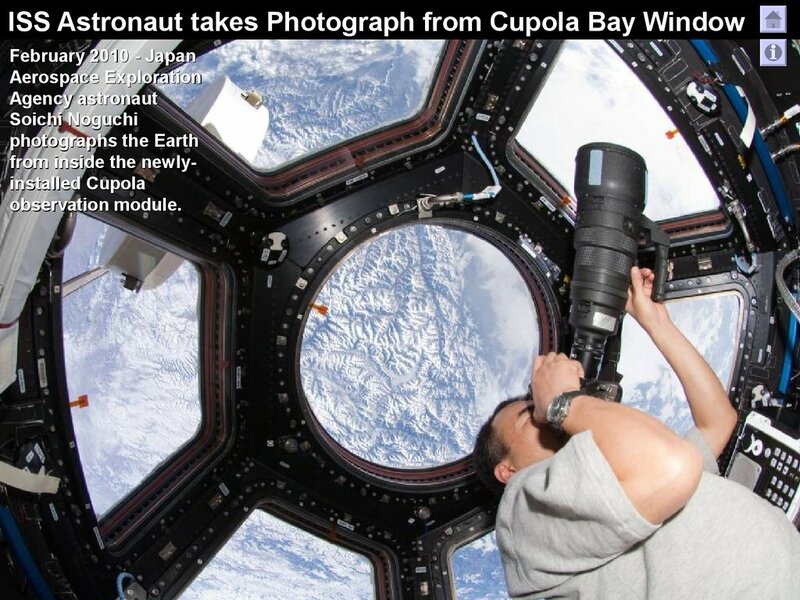 circular top window, 31.5 inches in diameter - the largest ever flown in space. 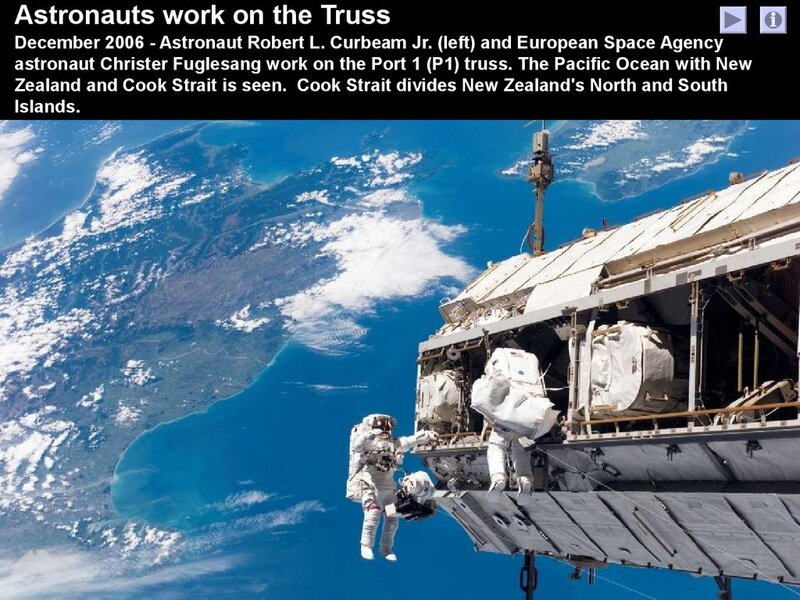 from space debris when the shutters are open. heating the Cupola or to avoid losing heat to space. 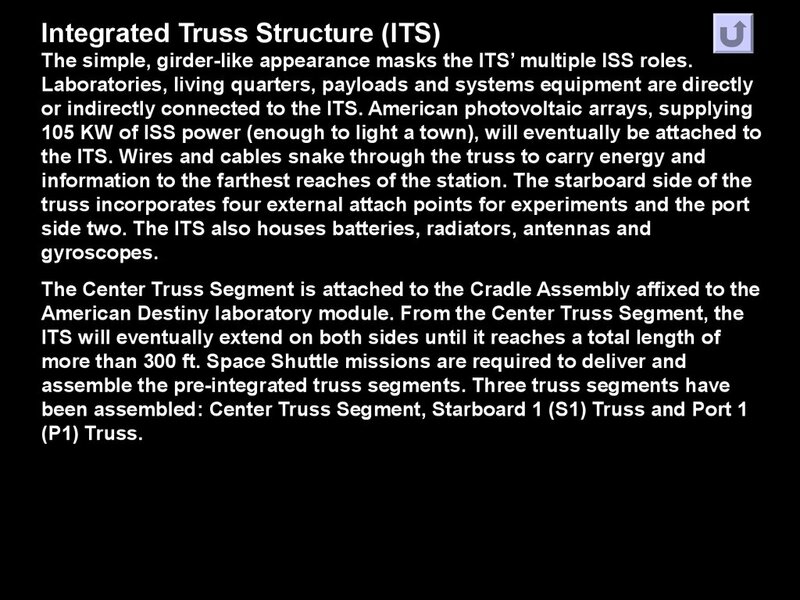 The simple, girder-like appearance masks the ITS’ multiple ISS roles. 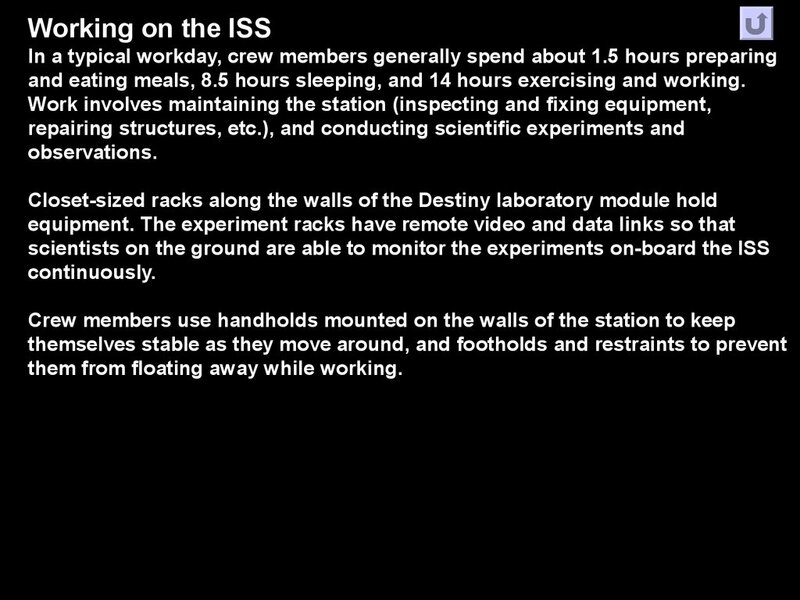 Destiny laboratory module architecture but it only has 4 equipment racks.